Andy Warhol is easily one of the most interesting people to have ever lived. I say this having known next to nothing about him other than his over-exposed, colourful reproductions of 1960s-1980s popular culture, all of which I found excessive, superficial, and ridiculous, up until two hours ago. Screened in accordance with Warhol’s long-time lunchtime devotion to the brand. 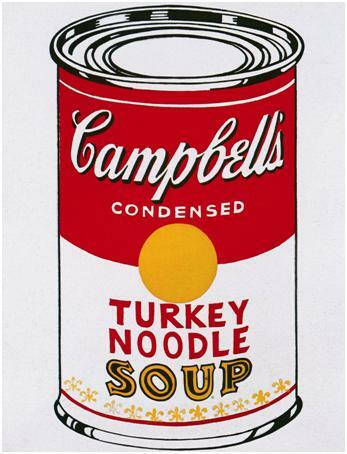 Andy Warhol, Campbell’s Soup Can (Turkey Noodle), 1962. Silkscreen ink on canvas, 51 x 40.6 cm. But wasn’t that essentially his intention, to explore popular culture? Spending most of his time at home as a young child and teenager, Warhol listened to the radio (and the adverts) and collected photos of film stars; he was greatly influenced by the growing popular culture of the 1950s. Starting his career as a commercial illustrator should come as no surprise to anyone, nor should the fact that, unlike other artists, he basked in the spotlight of fame that came from the success of his commercial art. 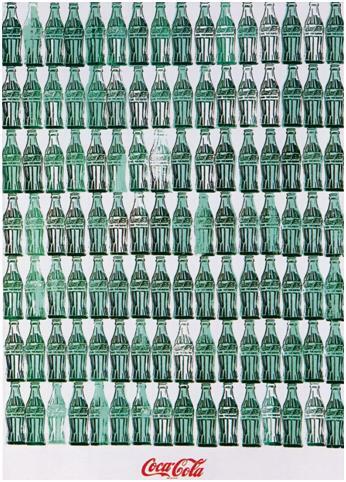 Screened for his appreciation of the wide-spread appeal of Coca-Cola – for the rich as well as the poor! Synthetic polymer, silkscreen ink, and graphite on canvas, 209.2 × 144.8 cm. Endlessly and un-sarcastically praising the plasticity of Hollywood, I’m convinced all Warhol wanted was his “fifteen minutes of fame” (did you know he coined that?). Little could he have ever imagined we’d still be fawning over his bright colours, cow motifs, and his Pope of Pop-(Art)dom over twenty years after his death. Though I think he’d be less impressed with the reality of what “fifteen minutes of fame” has afforded us by way of reality television (Jersey Shore and Honey Boo Boo, anyone?). What are you waiting for? Get yourself to the Mori Art Museum, Tokyo for the Andy Warhol, 15 Minutes Eternal exhibition.